Hamas-ruled military court sentenced to death by hanging and firing squad after being convicted of passing information to Israel. 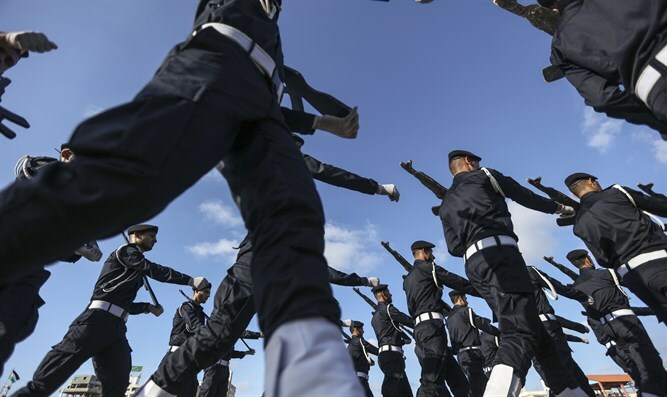 The Hamas military court, subordinate to the Hamas-controlled Gaza Interior Ministry, sentenced 14 Palestinians convicted of passing information to Israeli intelligence. Six of the convicted were sentenced to execution, of whom five by hanging and one by firing squad. Seven others were sentenced to life imprisonment with hard labor. An Israeli Arab woman was sentenced to death in absentia. According to the military court statement, Ali Shaaban, who was sentenced to death, allegedly assisted in infiltrating soldiers from special IDF units and photographed the residence of senior Hamas operative Mazen Fawakha who was killed in an IDF operation. Ibrahim Khaled, who was sentenced to death, also allegedly conspired with a woman who claimed to be working for a charity in Israel and through which he provided information about terrorist operatives, two of whom were assassinated by Israel. Muhammad Ibrahim, sentenced to death, in 2010 allegedly contacted a young woman who claimed to be working at an economic company and through which conveyed information to Israel about military positions of Hamas members. Bassam Mahmoud was sentenced to death by shooting after being convicted of transferring information on the location of tunnels and rocket launching sites. Akram Mahmoud, sentenced to death, joined an Israeli intelligence officer as a member of Facebook and gave him the location of Hamas naval force personnel and training areas. Amal Mahmud, a 45-year-old Israeli Arab woman, was sentenced to death in absentia after being convicted of contacting one of her relatives in Gaza who passed her information.